Mark your calendars, our next neighborhood event will be our first outdoor movie! When: Saturday, August 29, 2015. Movie starts at dusk, around 8pm. * We will have FREE popcorn for all that come. * Bring your own refreshment. * Be ready for fun trivia questions. * Preview old but good cartoon shows i.e. Bugs Bunny. * Bring your lawn chair. * Come early enough to mark your spot but not before 6:30pm. * All children must be accompanied by an adult it will be dark when the movie is finished. Bring your smiles. 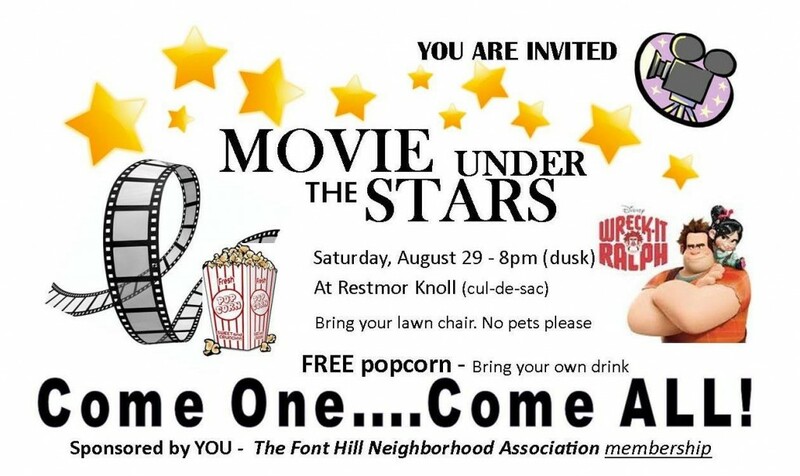 Come and Join your Font Hill Neighborhood Family. Let’s celebrate the end of summer break and the start of another school year.